Camiguin Black Beach Divers officially inaugurated today their dive base on the black sands of Agoho Beach. Congratulations to Axel and his crew. There is a long story – history? – behind this place. I do not tell it, because just today I received this short sentence from a dear friend: “Don’t look at the past, you can’t change it and it might make you cry”. Short, I liked to dive with Uli, Michèle, Arno, Romeo, Wing and Tintin. This is the past, it ended in August 2017. Today the Phoenix Effect did hit successfully. After 3 months of intense work Axel opened the new dive base in the best place of Camiguin: Agoho Black Beach. 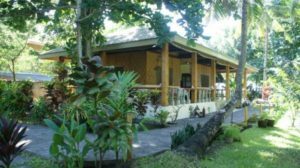 Imagine a dive base on a natural sandy beach with coconut and talisay trees. The beach is black, because the sand comes from the volcanic rocks. If you do not watch the waters of the Bohol sea and turn around, you see magic Mount Hibok-Hibok volcano. This is where the magnetic sand comes from. The festivities started this morning. The crew took one of the two dive boats and went out for a fun dive. Mid afternoon an opening party started in the beach resort where the dive base is located: Adrian’s Beach House. (Read also here). The catering had been outstanding (two leechons, rice, chili con carne, mango floats and beeeeeer). It’s been a big pleasure to meet old friends and dive buddies. Axel’s short speech -haha – the lechon was waiting. The Black Beach Lechon (rear view 😉 ) ,associated Philippines delices and a lot of rice. The crew. For someones memories may come up again. Ein Urgestein – and the beer had been cold. Sonja and Adrian met here some years ago. They came back. I’ll soon write about Sonja’s book. Kids instead of BCDs and wet-suits. Camiguin Black Beach Divers are already on Facebook. Soon their website will be on-line. In the coming days I’ll show you the technical installations and their affordable rates. Dear Axel and crew, we wish you all the best for your new dive base. Thank you for having the lights turned on again. We’re looking forward to making many happy bubbles together. Associated with the Sun, a phoenix obtains new life by arising from the ashes of its predecessor. In ancient Greece and Rome, the phoenix was associated with Phoenicia, (modern Lebanon), a civilisation famous for its production of purple dye from conch shells. In the historical record, the phoenix could symbolise renewal in general as well as the sun, time, metempsychosis, consecration, resurrection, life in the heavenly Paradise.